At Airhint we have just launched a new feature airfare alerts to save time for our customers and make sure you don’t miss a deal such as a sudden price drop. 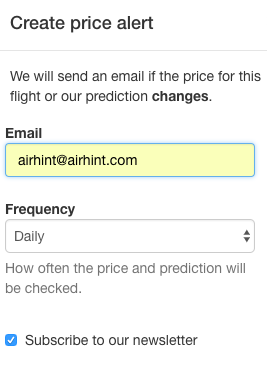 Since Airhint is specialized in flight price predictions, any significant change in the prediction will also trigger an alert sent via email. For example if a week ago we recommended to “Wait” and the recommendation changed to “Buy”, you will be notified. That makes our price alerts unique across the air travel industry. To subscribe for an alert, perform a flight search for a flight for your airline. 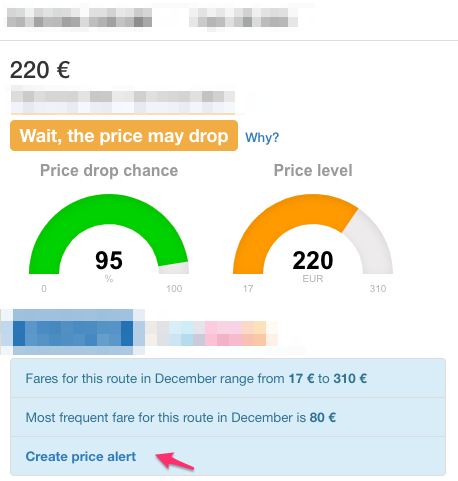 Along with the current flight price and the prediction there will be a link “create alert”. The alerts can be configured to be checked hourly, daily or weekly. You can also use the same email to subscribe to our newsletter to get the latest news about Airhint features and other relevant air travel and flight prices related info. Currently airfare alerts are available for the following-low cost airlines: Ryanair, easyJet, Vueling, Southwest, Norwegian and Wizz Air.